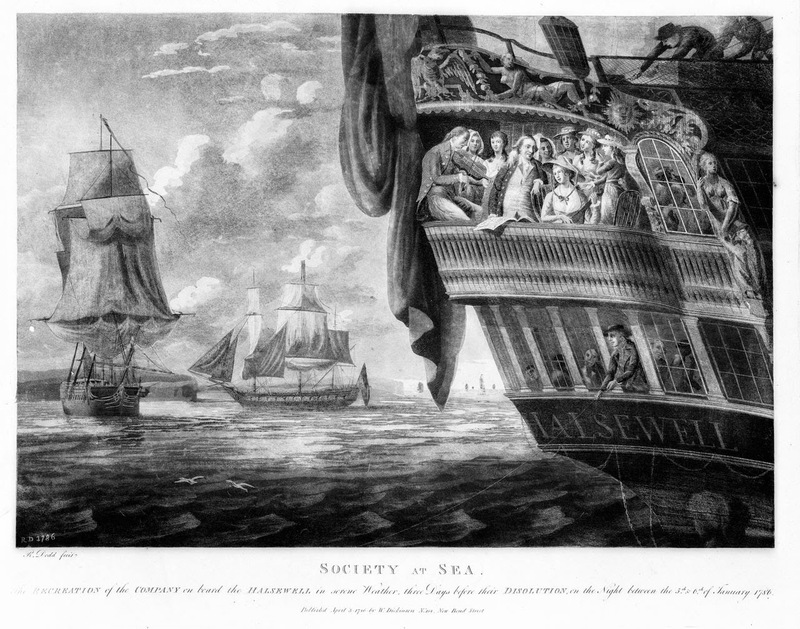 Society at Sea, artist unknown, 1786, National Maritime Museum. Captain Pierce and the passengers of the Halsewell enjoy music and companionship with good humor. Though no exact date is given to this piece, it must be in the weeks before the storms would batter the ship, leading to its eventual "dissolution." Few, if any, of the figures here would survive the wreck. 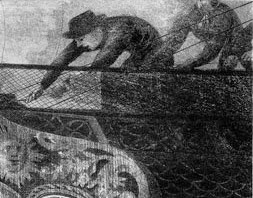 Two sailors are visible on the quarterdeck, but only just. Together they haul on a line, though its exact purpose is indeterminate. The sailor furthest aft wears a round hat with a flat crown and narrow brim. His jacket is close fitting, as is that of his mate. We can just make out a plain neckcloth on the other tar.